Following the ‘Multimodality: Methodological Explorations’ main conference, the PhD researchers working on MODE (Kate Cowan, Berit Henriksen and Jenifer Ho) coordinated a one-day ‘Multimodal Methods Swap’ for fellow doctoral researchers working with multimodal methods. Attendees were from as far afield as Hong Kong, South Africa and Brazil, and from a range of disciplinary backgrounds including visual design, computer science and the social sciences. Sites of application were equally diverse, including classrooms, businesses and online environments. 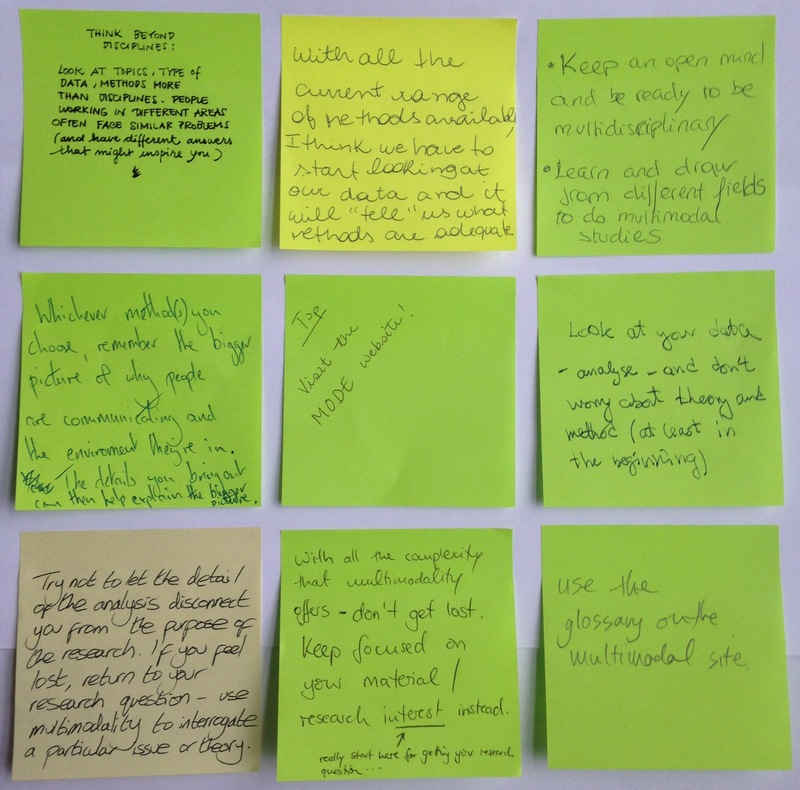 The aim of the ‘swap’ was to establish an informal environment where researchers could share issues and challenges relating to multimodal methods, and exchange suggestions and reflections from their own work. In the first activity, MODE PhDs presented challenges they had each faced in different stages of the multimodal research journey: Jenifer discussed the difficulty of multimodal data collection in online and offline sites of learning; Kate shared issues relating to ethics in multimodal research and the challenge of logging, sampling and transcribing multimodal data; and Berit considered how we might move beyond description in our multimodal analysis. In the second activity, participants divided into smaller groups to discuss challenges particular to their own research, making connections, sharing thoughts and offering suggestions. Despite our various research questions, disciplinary backgrounds and different sites of application, what connected us was a common issue of using and developing multimodal methods. This resonated with Gunther Kress’ closing conference comments, suggesting that as multimodal researchers we are united by ‘nagging questions’ that are not answered by reliance on language alone, and the need to seek out other tools and materials for answering them. In this way, it was felt that despite our diverse research interests, there was benefit in making and maintaining connections with other researchers working with multimodal methods. To continue the discussion, we have formed a ‘Multimodal Researchers’ Facebook Group where we can continue to ask questions, discuss issues and share links to useful materials, resources and events: https://www.facebook.com/groups/multimodalresearchers All those working with multimodal research are welcome to join this informal group. To close the ‘methods swap’, we invited each participant to offer one ‘top tip’ to another researcher using multimodal methods. We hope these are a useful resource and point of reflection for all engaged in multimodal research. If you have your own ‘top tip’ for using multimodal methods, please do add it to the comments section below. What ‘top tip’ would you offer to another researcher using (or considering using) multimodal methods?